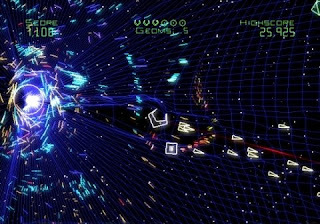 Planet Hell: Geometry Wars Galaxies and stuff. I've been playing a bit more of this on and off when I need something simple but fun and addictive. The game is on a few different systems, but I'm playing the DS version. I really like the control system with the D-Pad and stylus at the same time-its quite well done. This screen is not from the DS version which has slightly weaker visuals, but still looks nice. I think I played too much of this game somehow. The other night I had dreams of a neon wire frame dragon attacking me lol. I'd definitely recommend the game, even though it doesnt have any storyline its still a game I really like.